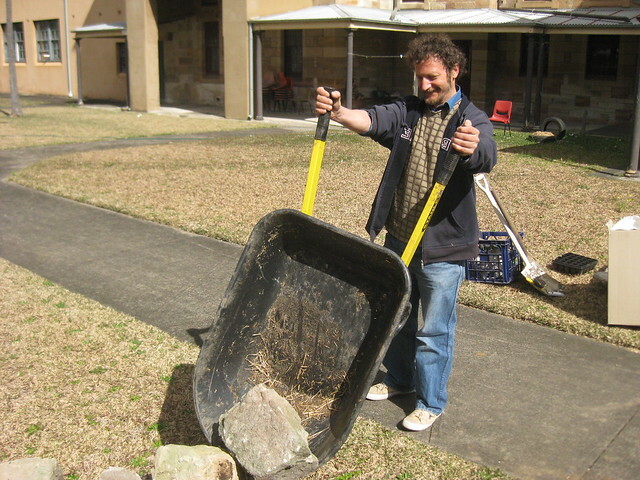 In 2009, when we were researching the best way to get TENDING started, Ross went to the Soil Science people over on Main Campus at The University of Sydney. A group of three students jumped at the project, for their final-year assessment. We proposed a ‘pretend consultancy’, with Sydney College of the Arts as the ‘client’ and Sophie Gulliver, Adrian Carrillo Garcia and Joshua Godbee as the ‘consultant firm’. 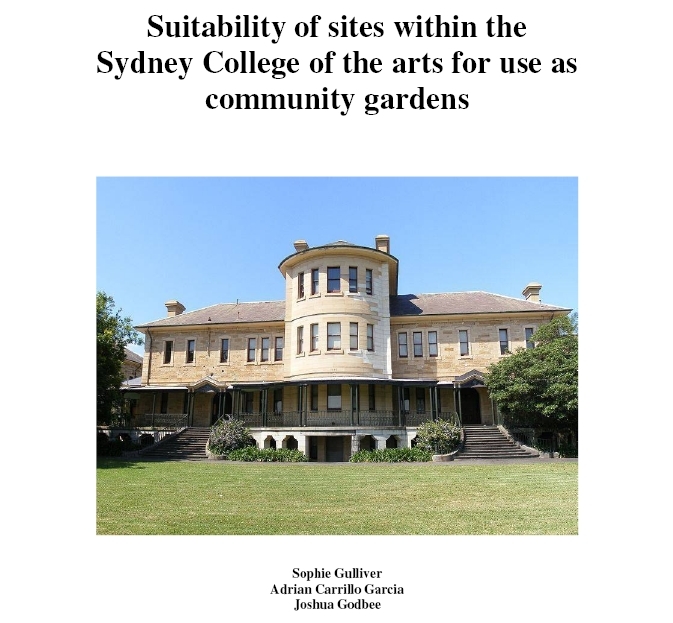 The client asked for a viability report and an account of the social and historical context for a ‘community approach to establishing gardens in SCA’s portion of Callan Park’. The report that the students produced is to be read as an exercise in education and professional training, of course. We emphasise that it has no legal status. But it is thoughtful and thought-provoking and full of good information. Which is why we present it here. You can download the full report here, it’s a 3mb PDF file. 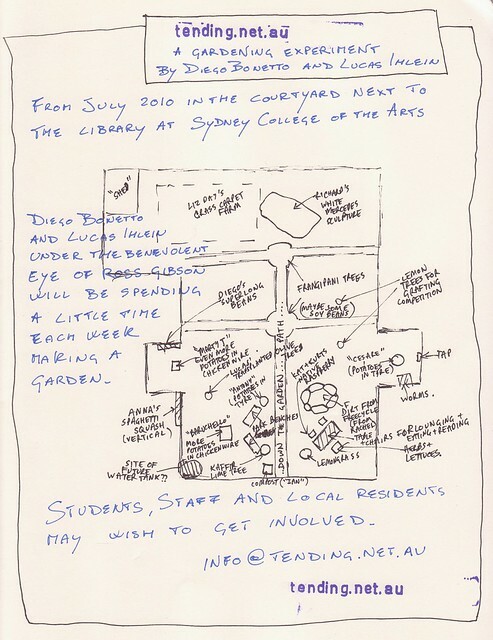 The SOIL3010 unit from the University of Sydney undertook an investigation into the agronomic suitability of sites with the Sydney College of the Arts leasehold for the purpose of creating a community garden. 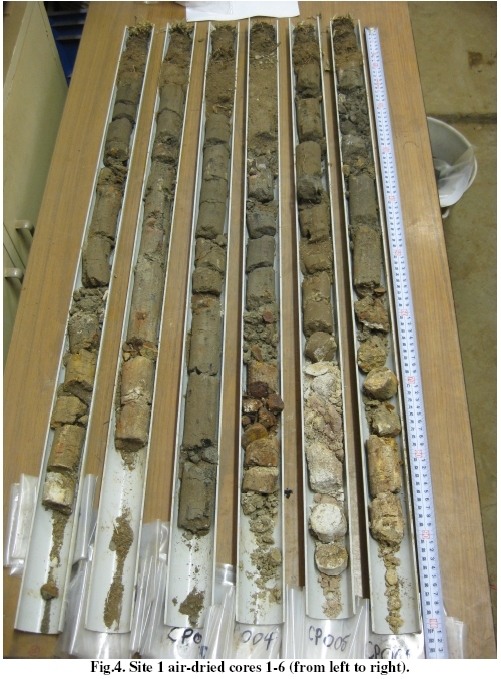 In order to establish the suitability of the soil for growing a range of plants as would be required in a community garden, physical soil samples were required. However, political and social pressures from the community meant that we were denied access to extract soil samples from any areas within Callan Park outside of the SCA lease. inhibitive to plant growth and development. Considering this, two recommendations have been proposed; the first involves a community garden at site 1 using the existing soil in conjunction with a soil remediation strategy to improve soil fertility and ensure plant productivity. The second recommendation involves the erection of raised garden beds at any of the sites which would negate the unsuitability of the existing soil. Raised garden beds would incur a greater cost of establishment however, it is a more culturally and socially sensitive alternative and would provide superior soil conditions for a sustainable and productive community garden. An additional low-cost and very effective method to improve plant growth and development is through compost teas. We recommend setting aside a garden bed and planting stinging nettles a month prior to planting the rest of the plants in the community garden. Stinging nettles growing vigorously in a range of soils and are very high in N, K and many other micronutrients. Once they grow to a reasonable height they can be harvested and placed in a bucket of water for approximately 10 days. This creates a compost tea which can then be strained, diluted and poured across the garden providing water and essential nutrients for plant growth (Woodrow 1997). This foliar fertiliser strategy can be continuously applied throughout the year to the entire garden and can be done at no cost. Following from Diego’s post about Thursday just passed… Yes, Tending is really hotting up now, in its own kinda slow, many-cups-of-tea-along-the-way, way. Thursday was an epic day. 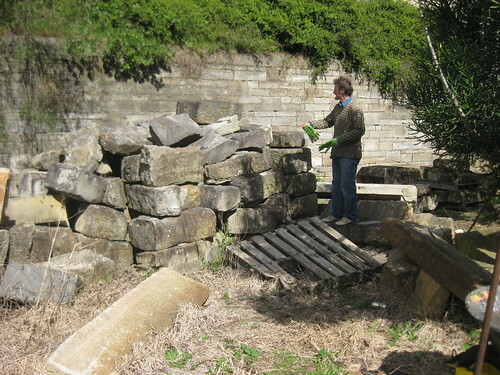 It began with the collection of more sandstone blocks from “the quarry”, which is a courtyard two down from our own. The quarry is like a purgatory for broken sandstone pieces from the SCA buildings. Grant the property services fellow showed us this space a few weeks back, and pointed out which blocks we could take, and which were off-bounds. It’s really satisfying to take the wheelbarrow over there and load it up with heavy chunks of this fantastic, site-specific building material. Besides the satisfaction which comes from the physical labour, and from the re-use of an onsite material, the stone blocks have another wonderful property. Unlike timber beams, they are able to be shaped in ways beyond the rectilinear. Yesterday we spent the day in wonderful company at Tending. Our good friend Heather visited us with gardener extraordinaire Cecilia Macaulay, and all together we ventured in to the reshaping of one of the garden beds. Cecilia is renowned for her intimate and permaculture-aware garden solutions, advising and running workshops on the subject in Australia and Japan, see her blog here. 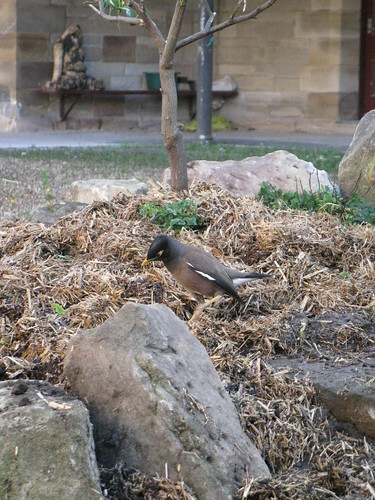 The lovely personality was a welcome addition to a rather windy day, and gave impetuous to the reshaping of a circular garden created a couple of weeks back. 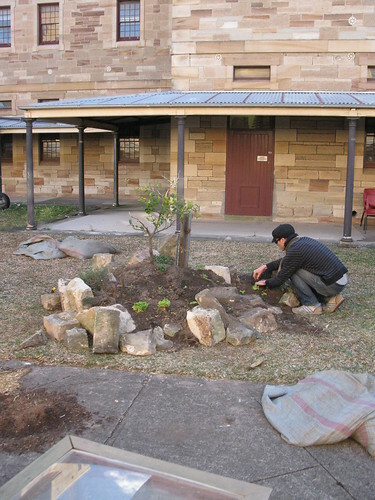 The careful selection of sandstones blocks available on site allowed for a more dynamic visual achievement which incorporated also the Kaffir lime, the Thyme bush and the Oregano into a little landscape. Big cheers for Jes as well, for taking pictures and general great company, and for Betty, who came along with a donation for the compost bin. Come and check out the changes during this Saturday’ SCA open day! So, both me and Lucas are pretty busy at the moment, getting ready the last details for the opening of the group show In The Balance: Art for a changing world, at the Musuem of Contemporary Art, Sydney. We both have work in it, Lucas doing an environmental audit of the exhibition, blogging the findings and discussions on this blog and printing a number of posters as well. While myself is presenting 5 Terrariums, 5 Tours and world of facebook friends (that’s the title). The terrariums have been constructed by Ian and Matt at the MCA, and they look fantastic, the tours will be in September and October, see here for details, while the facebook part is an attempt at elevating botanical species social status, by inserting them in the social network by excellence. So, that means that the tending project is not going to be attended this Thursday, sorry, bear with us, we will be back the week after with plenty of energy, to get ready the garden for the SCA open day on the 28th. 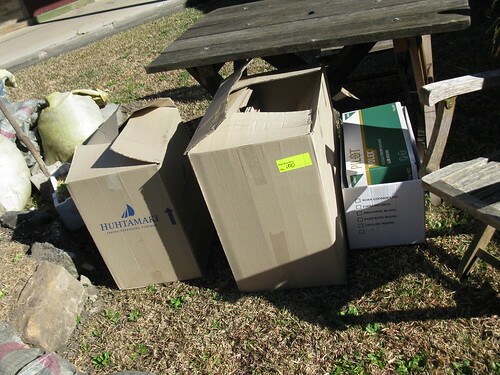 Regardless, as a good gardener, I went to check out the plants this morning, water a bit the straw planters and assess the general well being of the site, and i discovered a generous donation from Betty, the cafe’ manager, of cardboard boxes and food scraps for the compost bin, so thankyou thankyou! ..we will be on site Thursday 26! Sat 28 Aug, 10am-4pm, Balmain Road, Rozelle. 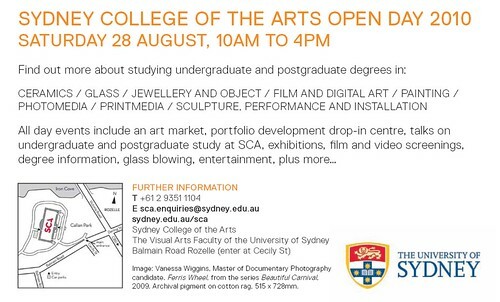 Here’s a flyer for the open day at SCA. NB: Diego and I won’t be trying to convince you to enrol in any university courses, except perhaps to join in our own self-directed educational cultivations… guaranteed not to increase your HECS debt!